* If you’re pushed for time, or just want the action points, scroll down to the last paragraph! Aged 15 I sat down with the careers adviser and told her the one thing I knew was that I didn’t want an office job. What I didn’t tell her (because I was too polite) was that this was because I thought that office jobs looked and sounded dull, boring and generally unpleasant. I held this belief until May 2015. May 2015 marked the beginning of my first office job: a three-month fellowship in the Parliamentary Office of Science and Technology (POST). You might think that, as the weeks of the fellowship went by and the novelty wore off, the appeal of going to work diminished. In fact, it did the opposite: as my time went on I loved going into the office more and more. So that belief I held about office jobs being dull, boring and unpleasant? I was wrong. ‘Community’ comes from the Latin commūnitātem, which means ‘community’ or ‘fellowship’. (fyi: fellowship = ‘friendly association’). Commūnitātem comes from commūnis, meaning ‘common’ and, originally, ‘sharing burdens’. (fyi: the ‘sharing burdens’ bit is because commūnis is made up of com-, which means ‘together’ and mūnia, which means ‘duties’). And this is exactly what it was like in my office: friendly association and burden sharing. It sounds a bit odd like that, but look at it this way: my colleagues and I got on really well and, when someone had work-related problems, someone else would gladly come alongside and help. But there’s more to it than that. And communities are built on more than that. Think about the different communities and networks you participate in: sports teams, friendship groups, family… What ties you together? Several – or perhaps many – things, but I bet one of the significant ones is ‘shared experience’. My colleagues and I clocked up quite a lot of shared experience. We gathered outside of work on several occasions: not just post-work drinks, we also did an escape room challenge, a pub quiz, and visited a city farm! Importantly, though, we also built up shared experience in the office. So, for example, you know that 3 pm lull? 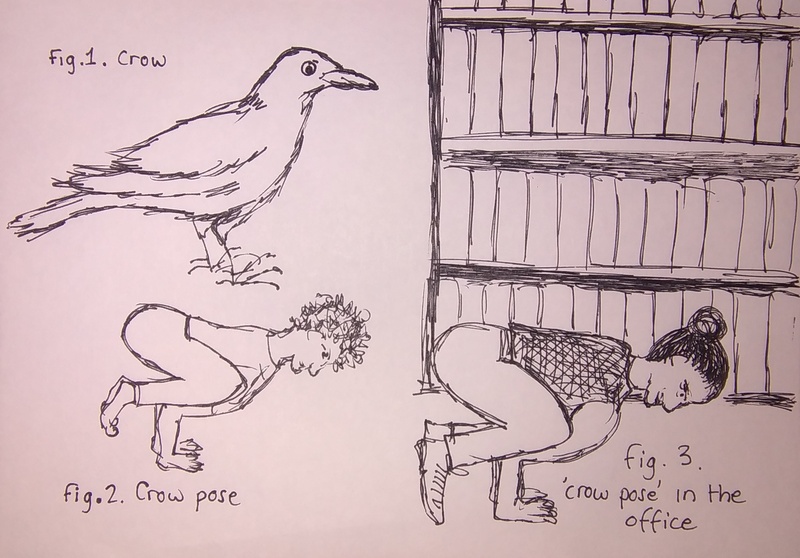 On fairly regular occasions, several of us got up from our desks, took to the floor, and attempted the ‘crow pose’ from yoga. We managed it to varying degrees of success, but that’s not the point; we had fun together, creating a shared experience which we could look back on, forward to, talk about, and bond over. Everyone has a role. Or, to sound less utilitarian, each member of the community brings, and is valued for, their unique contribution. And this was how it was in my office. How’s did that come about? Well, I think to a large extent because we talked to each other: we actually took lunch breaks most days and chit-chatted in the office. Through this we got to know each other. By that I don’t mean we heard about each other’s home lives etc; we did a bit, obviously, but it wasn’t just that. We chatted about all sorts of things: work; current affairs; popular culture; whatever, and through doing this we got to know each other and each other’s personalities and approaches to life. Moreover, spending so much time together (9 am to 5 pm x 5 + more), we got to know each other’s habits and quirks and, somehow, collectively and unconsciously, it seems we chose to celebrate them with affectionate teasing. So it was that everyone had a place in the community. Finally, and I suppose this last point is the result of a combination of all of the above: there were in-jokes. Okay, so, any examples I try and give of these from my family and friendship groups would be totally lost on you: if I say digestive biscuits and cheese or Lee Mack then you don’t have a clue what I’m referring to. But some people know exactly what those are references to, and that’s precisely my point. Similarly, in the office, and over time, we came up with our own in-jokes and in-stories. Maria Sharapova, for example, will mean nothing to you, but a lot to my colleagues. The in-jokes we created were another kind of shared experience: a way for us to form and strengthen ties in our (office) community. And here’s something else important: these ties didn’t just go between peers, but also across levels of seniority; they were a great way to form connections with more senior members of staff. Invest time (minutes add up to hours) in getting to know your colleagues – not necessarily the ins and outs of their home lives, but rather their personalities. Celebrate affectionately each person’s quirks. Develop in-jokes. I can’t give you more specific advice on this; the whole point is it’s got to come from you and your colleagues. Share burdens: help one another when you have work-related problems. Finally, and I think most importantly, see your office as a community. For so many people the words ‘work’, ‘office’ and ‘colleague’ have negative connotations. ‘Community’, on the other hand, tends to have positive ones. Perhaps just by simply seeing the group of people you spend ±40 hours a week with as a community, you will love it a little more.